Our God is not a weak God. Our Father is not a wimpy Father. He is, rather, an awesome God, a strong God, a loving Father who creates, gives and bestows without measure. Indeed He is a Father of tender goodness and mercy, but not a God of “handouts”. Our God tests our faith, proves our wills and our loyalty; and it was so from the beginning. Once the mighty stone rolled over the entrance of Jesus’ tomb, the silence of the small group that witnessed His interment mirrored that of the corpse within. Indeed, He was truly dead. He who had restored sight to the blind, hearing to the deaf, movement to the lame, and life to the dead, was now Himself dead. And as He breathed forth His divine/human soul, His bruised head fell heavily on His sunken chest. The corpse that was lovingly lowered from the cross, and laid in Mary’s arms was scarred beyond recognition, and ghastly pale, the last drops of blood spilled when His side was pierced. He had given all. And now He was dead. Back when He had first predicted that He would die, Peter, just constituted first Pope, was badly shaken. He tried to dissuade the Son from the Father’s will, only to receive the scathing rebuke, “Get behind me Satan! You are a scandal to Me because you understand not the things of God, but the things of men.” Matthew 16:23. Peter was thinking along human lines, hoping for an earthly kingdom in which Jesus would be universally acclaimed. He hadn’t fully understood that integrity such as his Master’s is never permanently crowned on this earth of sin and compromise. He hadn’t learned to trust God’s decrees even when they spell apparent death for, in the end, they always give life. He hadn’t fully understood that this life’s test is the test of confidence in the divine, not the human. And now, His Master was dead. Doubt flickered in all but one heart, a heart that knew not the shadow of sin, the heart of Mary. She who so penetrated God’s higher reasons that she had stood by the cross, alone knew that He would rise again as He had said. As Jesus’ corpse lay in the cold sepulcher, the fullness of faith was reduced to one heart. All was quiet that Sunday dawn. Mary prayed, and the apostles gathered behind closed doors. As Mary Magdalen and other holy women visited the tomb, they found the stone rolled, and an angel who showed them the empty place where His body had been, and announced to them that He had risen! And all those that had seen Him dead and buried, saw Him alive. Thomas even placed his doubting finger in the Lord’s open side. And one after the other, the apostles and first disciples, testified to His resurrection; and one after the other of the twelve, excepting John, sealed their witness with their blood by later dying as martyrs. Indeed Christ’s resurrection is the divine stamp on all He said and did. 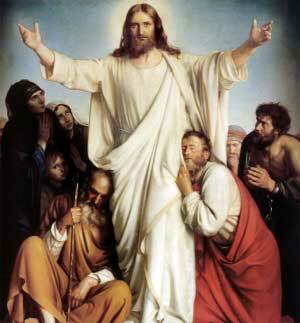 And his bride, the church, born of His pierced side, and confirmed at Pentecost came forth to conquer the pagan world. Hers would be fierce battles against persecution, heresy, and the very gates of hell, as her Bridegroom predicted: “And I say to thee: That thou art Peter; and upon this rock I will build my church, and the gates of hell shall not prevail against it.” Matt.16:18. And so it is. Through the ages, like Him, at times seemingly buried, the church always bursts forth in the splendor of her Truth. She is like the moon that only wanes to come back to full glory time and time again. In these days of seeming triumph of so much evil and flaunting immorality, in these times when chaos and confusion have infiltrated even the bride, let us stay with Mary, and our faith will not flicker. At the apparitions of Fatima in 1917, as Our Lady of the Rosary, she predicted war, chaos, calamities and persecutions, but also said, “In the end, my Immaculate Heart will triumph”. Let us pray and meditate on her Rosary, and we will not faint or fear, for Her Son’s word endures through the ages, “Have confidence. I have overcome!” John, 16:33. 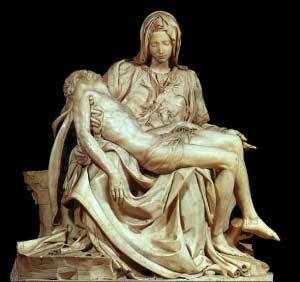 Pieta - Michelangelo's Pietà in St. Peter's Basilica.